Help CentreUsing SuperControl Tactical pricingHow can I add special pricing? Special pricing allows you to create custom arrival days for a specific length of time without the need to amend the main settings of your price planner. This feature is useful for periods such as Christmas and bank holidays. 1. Go to Properties > Edit > select property > Price Planner > Go. In the following example only allow a Monday and Friday is allowed for arrival. However, you can allow a Tuesday to be enabled as an arrival for a specific date to fill availability easily. 2. Click on the date you wish to enable for a special price within the "Spec. prices" row. 3. Enter Number nights eg. From Tuesday 14 Aug 2018 I wish to allow a 3 night stay only. Enter the price for that stay. Enter a reason (not compulsary) eg. Bank holiday. 4. Tick any additional settings and click Save. Allow bookings to end of this date - if this box is ticked it means a guest can choose to also depart on this date. 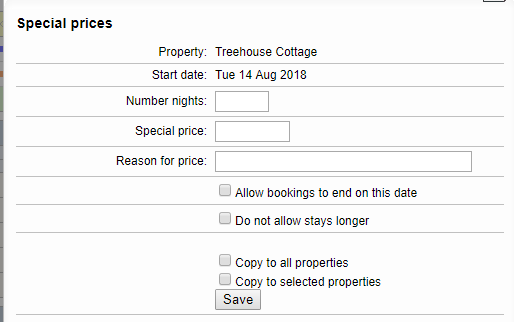 Do not allow stays longer - this means regardless of your next available arrival day, ticking this box means a guest can book 3 nights from this date and nothing else. Copy to all properties - Tick this to copy this special price to all other properties. 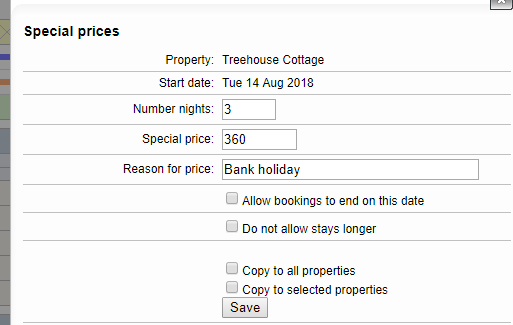 Copy to selected properties - Ticking this will open a window for you to manually select multiple properties to copy this special price to. (Hold the Ctrl/Cmd key down to select multiple properties). You can add multiple special prices to a single date. To do this just repeat steps 2-4 above. For a webinar all about pricing strategies go here. Prev: How do I set up and use price seasons? Next: How do I add my housekeepers?